Droom helmet sale– Hi Friends, welcome back to avjtrickz. We are back with droom helmet sale. Droom is India’s first mobile marketplace to buy and sell new and used automobiles. The current experience of buying and selling an automobile is antiquated, completely broken and full of stress, anxiety, pain points and pitfalls. Droom is offering 21st century experience in buying and selling automobiles. Droom helmet Sale Date and Time– Brand new Droom ISI marked Helmet, Next sale will start on 1st august 2018 at Rs 89/- from 11 A.M. on wards till 7 P.M.
Droom is back again with helmet sale. They offering Droom helmet worth Rs.850 at just Rs 89. The sale will be live on august 1st 2018 that is today. They also selling car perfume and sipper bottle at low price as similar flash sale. The best thing is that It is ISI Certified Helmet. 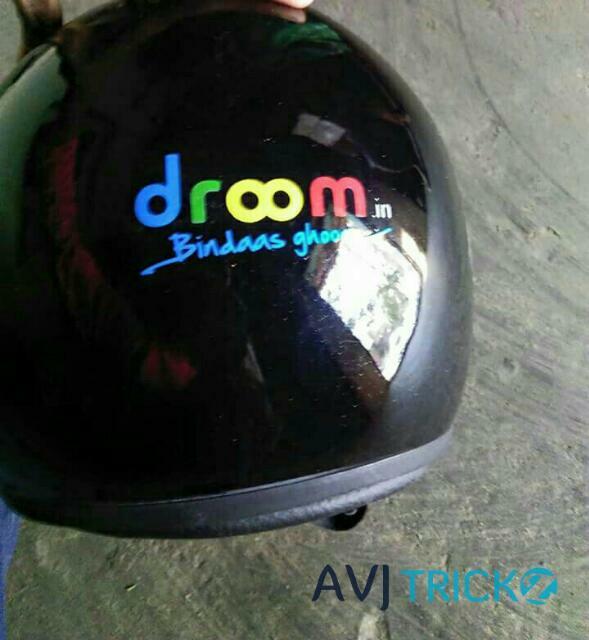 Droom is a Trusted Vehicle Seller In India Is Going To sell a ISI Certified Helmet At RS 89. This Offer valid Only till Stock Last. Register Fast To Get Helmet At Rs.89, So Read Below to know How To Buy This Helmet Online in sale. Now Enter Your Name, Email, and Mobile no. and click on Remind Me. Now come back to sale page on sale day to get Helmet at Rs 89. Now Login/Signup for your Droom account. Enter or Update your shipping Address. All the best guys! Hope you purchase it successfully since there will be high demand. Sale will be Live on 1st august 2018 at 11 AM Onwards. ISI Certified Helmet at Just Rs 89.